Will the new Doctor be revealed tonight? Porcelain: A Gothic Fairy Tale is finally hitting the shelves! 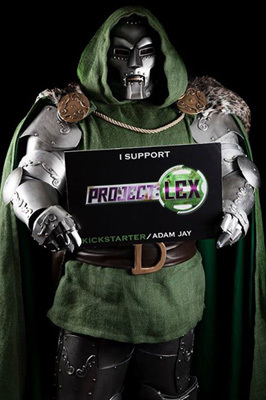 Adam Jay of Superhero Creations needs your help for his latest endeavour, Project: LEX. Project Lex is a dream project inspired by the opening cinematic for The DC Universe Online. This will manifest as a cosplay shoot of a scale not yet seen featuring several characters including Lex Luthor, Superman, Batman, The Flash, Green Lantern, Wonder Woman, Cyborg & The Joker. Other characters including Black Adam, Green Arrow, Deathstroke, Catwoman & Harley Quinn may also be featured if the funds are there. The funds raised for Project:LEX will go towards costume builds (including Lex Luthor’s War Armour), shipping fees, location costs, transport, food, accommodation for actors/models and rewards. In return for your support you can get rewards ranging from a postcard featuring the character of your choice to actually featuring in the shoot being taken out by Lex Luthor or saved by Wonder Woman (reward does not include flight/travel).